Research Publications of Faculty at National and International levels. National and International Conferences, Symposium and Workshops . Well equipped, furnished and spacious Laboratory with precision Instruments useful for Research. To motivate the students for Group Discussion on Scientific Topics of relevance, interest and latest happenings To Start Post Graduation in Physics with Preferably Thin Film Physics/Materials Science To arrange Industrial visits in adjoining ares. To motivate and provide the necessary guidance to the students to pursue M.Sc.and Integraded Ph.D.Programmes of Institutions of National Importance such as IIT’s, IISc and IISER’S Submission of minor/major Research projects with various funding agencies such as UGC,DST. Mr.Raising Patil – Qualified M.P.S.C. Examination and posted as P.S.I. Mr.Subhash Todkar –Working as the Head-CSSD at Ruby Hall Clinic Pune. Dr.Savita Chougule –Patil and Dr.Amol Patil Working as Assistant Professors at Govt.Engg.College, Karad and T.K.I.E.T,Warananagar. Miss.Pooja Mithari –Scored 96.5% in B.Sc.III Principal Physics in Shivaji University,Kolhapur in 2013 and secured 1st rank in M.Sc. entrance Examination and secured 16th rank in M.Sc.entrance Examination conducted by Pune University,Pune Besides Four students of 2013 join M.Sc. at Shivaji University and Affiliated colleges of Pune & Mumbai University. 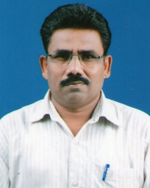 Dr.V.B.Chogule obtained Doctorate of Philosophy Degree from Shivaji University,Kolhapur (1989).